On this celebratory occasion, we are doubling down on the idea of Blue Marble Evaluation, an approach and framework for evaluating global systems change initiatives. Global challenges like climate change, global economic interdependence, and the global food system operate beyond national borders. Global systems change initiatives are intervening from the perspective of a complex, dynamic, and interconnected world system. Blue Marble evaluation is needed to assess the effectiveness of global systems change initiatives. If you are interested in becoming part of the Blue Marble Evaluation Network, please take a few moments to complete a brief survey to help us grow this important work. Click here to take the Blue Marble Evaluation survey. Blue Marble Evaluators describing the place where they were born without using country names. Camera is standing in North America, looking SE towards Australia. Blue Marble Evaluators where they current live or work. With this exercise, we were challenging the primacy of national borders, which we believe often get in the way of systems change. In the words of Albert Einstein, "you can never solve a problem on the level on which it was created." Next we watched a video of the changing borders of Europe to drive home the idea that national borders are artificial and the result of war, colonialism. We also watched the DNA Journey, a powerful video by Momondo, which shows what our DNA reveals about where we come from. All of this was intended to re-frame our way of thinking from a global perspective. We ended this introduction with the Blue Marble Shot, the first complete photograph of the Earth taken from space in 1972. Each participant also receive a blue marble as a reminder to take the blue marble perspective into their work. After this introduction and re-framing, Michael walked through the evolution of evaluation into an international field, culminating with 2015 as the International Year of Evaluation. While the focus on building evaluation at the country-level is important, we believe that the next frontier for evaluation is for exaluators to apply a global perspective to their work and build our capacity to evaluation global systems change efforts. At its core, evaluating global systems change involves looking across both sector and national boundaries. 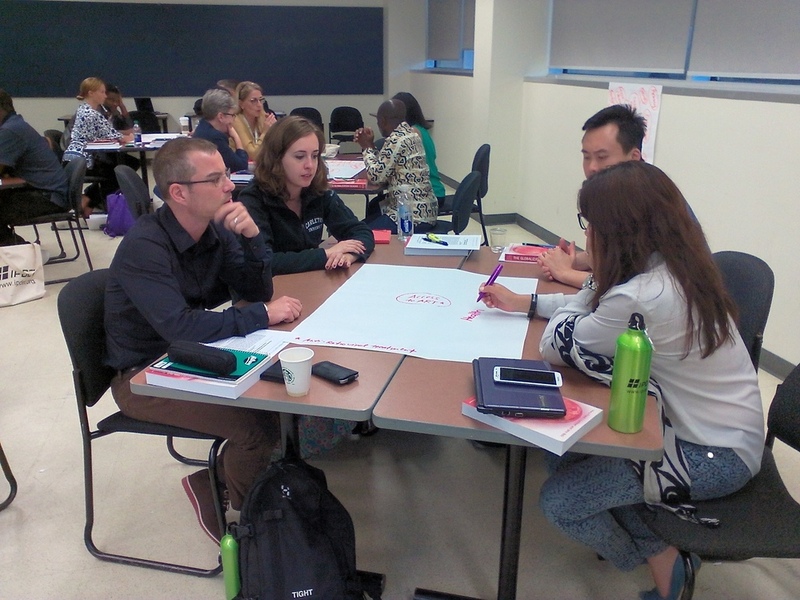 Over the course of two days, we explored what this might look like through case examples and exercises mapping global issues, diving into systems thinking and complexity concepts, and working with a real-world example from the Global Centre for Pluralism. Check out the gallery below for some photos of this work. There are many challenges to evaluating global systems change, but this workshop reinforced our belief that this approach is lacking and necessary, especially in the field of international development. We hope to increase both demand for Blue Marble Evaluators and the supply/availability of them. On one hand, there are already many global initiatives operating, but few have evaluators at the table to inform decision-making and encourage the use of systems thinking and complexity concepts in their evaluation approach. On the other hand, there are even more development projects being undertaken without a global perspective despite the fact that the issues they are addressing are undeniably global. We believe Blue Marble Evaluators can play a role in helping to re-frame these projects and design evlauations that capture the complexity and system-wide implications of this important work. Ultimately, what came out of this workshop was the recognition that evaluating global systems change requires Blue Marble Evaluators who understand the historical forces that have shaped the current world system, are committed to developing their cultural competence in order to effectively collaborate and communicate with diverse populations, and bring a unique combination of empathy, humility and the capacity and willingness to speak truth to power in highly politically-charged situations. The first cohort of IPDET Blue Marble Evaluators are tackling a range of complex issues from land rights in the Mekong delta to migration in West Africa, access to anti-retroviral drugs to human security. We hope this workshops laid the foundation for these pioneers to bring a blue marble perspective to their work.